Plain ol breadcrumb breaking gets booooooring. It’s always good, just a tad bit played out. I was craving a certain crunch that I couldn’t get from plain ol breadcrumbs. Nowadays I prefer panko over any other breadcrumb because it’s a little crunchier but it still doesn’t cut it when I want a nice bite on a curler with some gravy that won’t turn it into some soggy chicken. This recipe calls for a food processor or nutribullet of some sort. Anything to chop up the almonds so they become extremely fine like a bread crumb. I used 1 cup of salted almonds and just chopped them right up in my nutribullet. If you’re feeling bold, go ahead and hand chop the nuts but try to make them as fine as possible to avoid an overly nutty crust. The plus side of this recipe is almonds are full of nutrients and healthy for you and I bake the chicken cutlets instead of fry them. Double whammy for you healthy folks. Preheat oven to 375 degrees. Foil a 9×13 baking sheet. If you have a wire rack, place it on top so the chicken can rest of the rack and not the tray. If you have a tray only then lightly spray it with nonstick spray. While your oven heats up, start the processing process. Process your almonds and rosemary until they are breadcrumb like consistency. (Remove Rosemary leave from hard stem before!) Once they are processed, transfer to shallow dish. Add your panko and additional seasoning and mix together. In a separate shallow dish, add your flour. In a mixing bowl, whisk your eggs together and season with a teaspoon of salt and a teaspoon of black pepper. 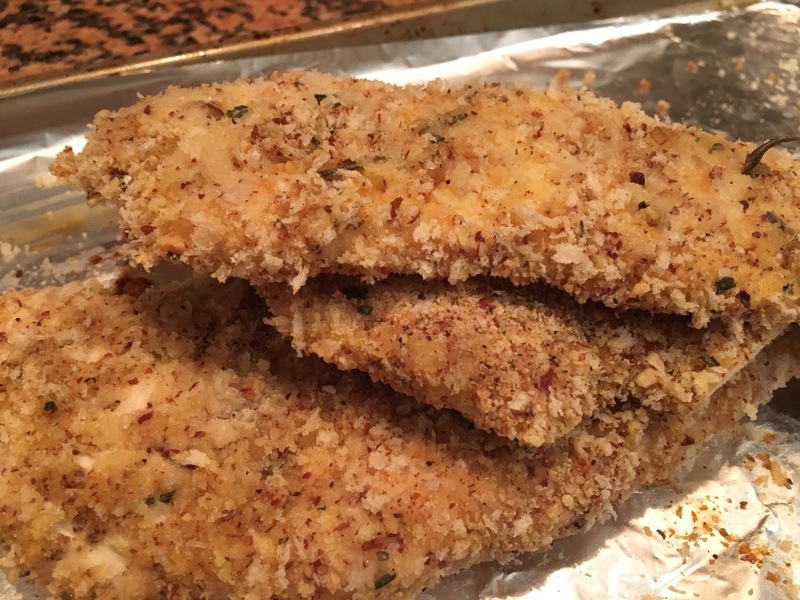 Coat your cutlets in the flour first, shake off excess, dip into your egg mixture, dredge excess, then add to your breadcrumb mixture and flip until fully coated. Repeat that process until all cutlets are breaded and on your baking sheet. Bake for 18-25 minutes depending on thickness of cutlets. You can most likely tell when they are done by the crunchy crust.